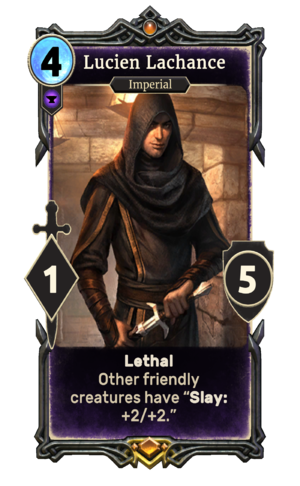 Lucien Lachance is a unique legendary Endurance creature card. It is part of the Core Set. "Heed my warning, I will not repeat it." "Praise to our unholy matron." "Your reckoning is at hand." "I will send you to your death!" This card's ability applies the The Black Hand Speaks card effect. Lucien Lachance first appeared in Oblivion. This page was last modified on 15 February 2019, at 18:50.